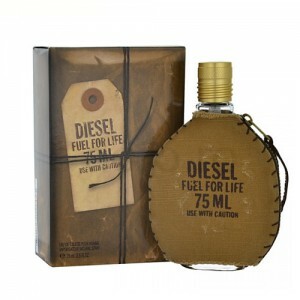 Diesel Fuel for Life for Him is a sensual exciting fragrance for men. Diesel Fuel for Life for Him 75 ml. Eau De Toilette is a sensual exciting fragrance for men who can live life to the fullest. Love the movement, casual style, freedom and space. Rich and life-giving perfume conceals elixir of passion and desire. Fragrance Fuel for Life Homme enchant you and your surroundings! In the introduction fragrance will immediately captivate refreshing star anise and just ripped juicy grapefruit. At the heart discreetly conceals playful raspberry sweet and intoxicating lavender. Sultry basis illustrates heliotrope mysterious and charismatic blend of different dry woods. This stunning urban and perfume from the famous brand Diesel is perfect for all day wear and for every season. Men's perfume Diesel Fuel for Life Homme fragrance is for true connoisseurs! Diesel Specialists include fragrance notes of heliotrope, raspberry, lavender, grapefruit and anise. This composition makes the fragrance refreshing and invigorating. He is incredibly active, and is strong and courageous flavor. It blows from the youth and fun that characterize the nature of passionate youth. a charge of energy embodied in men's fragrance. Fragrance drew the attention of his unbridled passion, indescribable power and lust for life. It embodies youthful rebellion and rebellious spirit that destroys all stereotypes and allows you to fully open up and feel the fullness of life. Purposeful and always knows what she wants from life - that man flavor FUEL FOR LIFE MAN.